Home » Copycat Restaurant Recipes » Houston’s Walnut Apple Cobbler – no one makes food like Houston’s. Houston’s Walnut Apple Cobbler – no one makes food like Houston’s. When I tried the Houston’s Walnut Apple Cobber, I knew we had recreated the Houston’s Walnut Apple Cobbler. This is wonderful! This is really best when served warm. By far, the Houston’s Walnut Apple Cobbler, has been the best apple cobbler I have tried, we combine many different layers of apple flavor to make it taste just right. No one makes apple cobbler like Houston's. Filling In the mixing bowl add canned apples, water, walnuts cinnamon, nutmeg, salt, butter, corn syrup, brown sugar ingredients and stir well. If you do not have enough apple juice from can of apples add a little water to make up the difference. Set aside. This is easy to blend in a food processor. Cut butter into four pieces and place in the processor, add sugar, vanilla, and egg. Process until blended. Add flour, baking powder, and salt, blend dry ingredients until all is mixed well. Should form a ball very quickly. Remove from processor and place between waxed paper and chill just long enough so dough may be rolled out without sticking to the wax paper. Spray baking pan with an oil spray and pour walnut mixture in an 8"x11.5"x2" baking dish and cover with rolled out cookie dough topping. Bake at 375 degrees 20 - 24 minutes, the top should be golden brown. Walnut cobbler should be served hot with crust side down with a generous serving of your favorite vanilla ice cream on top. Please use apples that are packed in water, not all stores carry these. Brands that do make sliced apples in water are Musselmans and Lucky Leaf. Way too much butter/ not enough flour in the cookie topping… A greasy soupy mess. Find a recipe that works! This came out a soupy mess, too much liquid not enough apples. Crust was pain in the neck to roll. Wouldn’t make it again. i work at hillstone/houstons…the key to the cobbler is a chef pierre Apple cinnamon hi pie. yes you’re paying 8 bucks for 1/6 of a $5 pie. This recipe was a disaster. I made this last night, I added some rhubarb and it turned out to be the best apple cobbler I have ever made. Will be making it again. You made it to complicated. Here is recipie take it from someone who knows. Use Sara Lee “Hi-Pie” Basic apple Pie, remove top and press into baking dish, take aplles and mix with cin, and all spice plus a squeeze of lemon. Toss and place in baking dish with crust, take bottom of pie crust ans place on top, small slits to vent cook per directions. While cooking make a simple caramel, 1 lb no salt butter and one Lb brown sugar, heat on medium and ruduce to caramel cosistancy, remove from heat stir in 1 tbl cin, 1 Tbl water and 1 package walnuts. 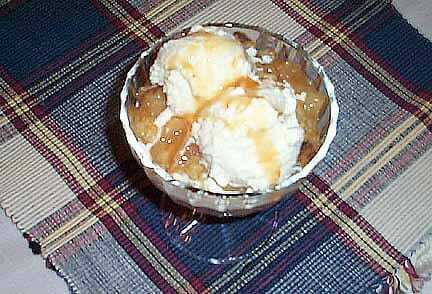 Pour hot caramel over cooked apple cobbler. Let set at room temp. Cut into squares and reheat in micro. Serve with scoop of “Dreyers” vanilla. I don’t know what Hi-Pie is, is this a commercial product? Yep, Chris has the idea! It tasted exactly like Houston’s and I had made it this way on numerous occasions! Always a hit! Where do you buy canned sliced apples? I bought them at Kroger. Thanks much! I haven’t been able to find them anywhere!! I will double check when I go to the grocery store this weekend. If not, I will update the recipe. I normally shop at HEB (a Texas chain of grocery stores), and Kroger. Everyone leaves out the best part of the recipe, the caramel sauce! Am I missing something?